Last week provided strong evidence of two interconnected realities. 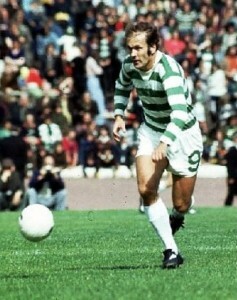 Harry Hood is still a class act; and Celtic could do with him now in preference to the Languid Greek. Last Saturday Harry Hood was the star turn at the Launch by Ringwood Publishing of its two books “Yellow Submarine – the Miracle of Villarreal” and “Celtic Submari – A new Model of Football relationships based on Respect and Affection not Hatred and Bitterness”. Last Sunday the poor display by a toothless flat Celtic team showed the crying need for a front player with the combination of skill and finishing calmness and precision that was the Harry Hood trademark. The affection still felt by Celtic supporters for Harry Hood was demonstrated in full measure at the Ringwood Launch, held, thanks to the generous co-operation of Eddie Toner, in the Celtic Supporters Association Club in London Road. The predominantly Celtic audience were delighted as Harry Hood drifted through them with the casual ease with which he used to penetrate opposition defences. Harry talked to the other star guest, Ernesto Boixader the leading inspiration of the Villarreal Celtic Submari and an ex-professional player for Villarreal CF in the 1980s, as one professional footballer to another. Harry confirmed that Billy McNeill had got it dead right when he talked of Atletico Madrid in 1974 as being the dirtiest, most cynical team they had ever encountered. (See the GGW post of 16th September). 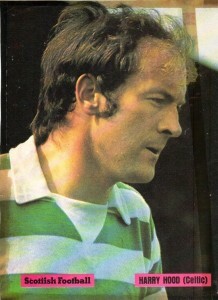 Harry explained that on a recent trip to Spain he had been surprised to learn from Spaniards that that the Spanish public had never seen film of that horrendous evening at Celtic Park and had somehow been given the impression that Celtic were the “villains” not Atletico, hence the hostility shown to Celtic in their trip to Madrid for the second leg. After the very successful launch, both Dave Webster, the Managing Director of Ringwood Publishing, and Sandy Jamieson the author of both the books, paid tribute to Harry Hood’s generosity in giving up some of his Saturday night to assist the launch. “We are very grateful to Harry, his presence was much appreciated by all the attendees” said Sandy Jamieson, whose pleasure in Harry’s attendance was enhanced by the fact that Harry Hood was one of his own idols as one of the all-time Clyde greats. The Old Firm game the day after the launch provided strong evidence of how much Celtic could benefit from a forward with the talent and ability of Harry Hood. He was a hard player to categorise. He was not a classic centre forward, despite a goals to games ratio of almost 1 in 2. Nor was he just a midfield player although his passing skills were immense. He was that rare kind of player who exuded class all over the top end of the park, defying easy categorisation. In some ways his main point of comparison was to players like Platini, Cruyff and Zidane, not out and out forwards yet who still scored far more goals than most forwards and all other midfielders. Such comparisons are not ludicrous. Okay Harry Hood was not quite as good as Platini, Cruyff and Zidane, but at his best he was a similar combination of skill, elegance and danger. 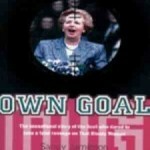 Like all great players Harry made the difficult art of scoring goals look simple. Celtic supporters were in no doubt about his class, and his commitment to their cause. “Harry, Harry: Harry Harry: Harry Hood” that Hare Krishna derivation and the other song, “Feared by the bad, loved by the good, Harry Hood, Harry Hood, Harry Hood” based on the Robin Hood classic, were two of the favourite Celtic Park anthems of the early 1970s, proof of the high degree of affection the Celtic support felt for one of the most skilful forwards ever the wear the green and white hoops. In his spell with Celtic from 1969-1976 Harry won 5 League titles, 3 Scottish Cups and 2 League Cups scoring 123 goals in just over 300 games. He convinced most Celtic supporters, if not always the gruff management, that he was a truly skilful player of the highest class. He remains the last Celtic player to score a hat trick against Rangers. Watching the woeful efforts of a lost and indolent Samaras last Sunday it was hard not to imagine how much more effective Celtic would have been if the Harry Hood of his prime had been on the park. Like many great Scottish players Harry Hood was born at the wrong time. In the modern game, with its obsession with one man forward lines, he would have been a sensation as a highly skilled yet always calm finisher, providing danger in the spaces just behind the lone front man. So thank you Harry Hood. Thank you for all the happy memories of you as one of Clyde’s greatest ever players. Thank you for all the great performances for Celtic, making goalscoring look easy, over 100 times, oozing class all over the front areas. Harry Harry, Harry Hood, you really were that good. We all could do with you now. Thank you for helping launch my books. You are a gentleman. Hi Harry, I have a wonderful photo of the Troon juniors versus Glasgow Celtic F.C. in 1968/9,with YOURSELF, and the MIGHTY JOCK STEIN, LOU MACARI etc.which I would like to give to you.If you have an email address, please let me know,IF NOT-Iwill deliver to your Business in Uddingston.John Bannerman-when Referees were GOOD in Scotland.!!!!!!!!!!!!!!!!!!!! !